Palbociclib (Ibrance) has been shown to overcome ibrutinib (Imbruvica) resistance in primary human samples and mantle cell lymphoma (MCL) cell lines with the mutated BTKC481S protein. 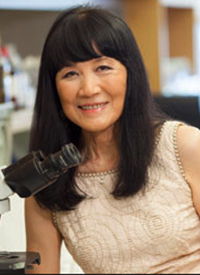 The use of this CDK4/6 inhibitor has sparked an investigation into combination therapies to target CDK4 in MCL, said Selina Chen-Kiang, PhD. Although CDK4/6 inhibitors have been garnering attention in the breast cancer landscape, targeting CDK4 is a rational approach in MCL, as dysregulation of CDK4 and cyclin D1 underlies unrestrained proliferation of MCL cells, said Chen-Kiang. Additionally, targeting tumor cells in lymphoid malignancies offers a unique advantage over solid tumors, as the cells can be purified in real time. The findings from clinical trials involving CDK4/6 inhibitors in MCL, for example, may provide a deeper understanding for investigators who wish to use these agents in solid tumors, added Chen-Kiang. In an effort to address how CDK4 inhibition enhances therapy vulnerability, Chen-Kiang developed a phase I clinical trial of palbociclib, findings of which were discussed at the 2018 AACR Annual Meeting. Palbociclib was administered to patients with MCL for 12 days, and bortezomib (Velcade) was given in prolonged early G1 arrest after synchronous S phase reentry. Of 6 patients who received the regimen, 1 progressed, and 1 patient has been in complete remission for 6 years. These data suggest that CDK4 inhibition reprograms MCL for therapy vulnerability through induction of antitumor interferon response. In an interview with OncLive during the 2018 AACR Annual Meeting, Chen-Kiang, a professor of pathology and immunology at Weill Cornell Medicine, detailed the research being conducted with CDK4/6 inhibitors in MCL. OncLive: Please provide an overview of your talk on CDK4/6 inhibitors in MCL. Chen-Kiang: I spoke about how to target the cell cycle, particularly CDK4/6. That is where the cells go into the cycle. We have come a long way—in 2014, there was just 1 CDK4/6 inhibitor, and now there are now 3 FDA-approved CDK4/6 inhibitors for breast cancer treatment, and 2 [more] are in the pipeline. Specifically, our work is designing ways to target CDK4 through combination therapy. Also, to understand why it works for some patients and not others with MCL. That is one of the best systems to address the question, because every patient's tumor cell has a chromosomal translocation. Therefore, it overexpresses cyclin D1, which is a partner of a complex with CDK4. All of these patients also overexpress CDK4. Targeting the tumor cells in lymphoid malignancies has a unique advantage that you cannot get in solid tumors; you can purify the cells in real time. This allows us to ask what the difference is between the cells from patients who will respond and those who will not. In a phase I trial that we completed, a CDK4/6 inhibitor was combined with a proteasome inhibitor sequentially. A very important part of this approach is the longitudinal analysis, meaning that you use the baseline of each patient as their own control. Then we asked, “What are the changes in gene expression after treatment with a CDK4/6 inhibitor, but before the second drug comes in?” We then asked, “What is the difference between a responder and a nonresponder?” By doing that, we now have candidate biomarkers. Are there any next steps? The important thing in targeting CDK4/6 is combination therapy. We want it to be nontoxic, so the mechanism must be understood. By doing that, we now have finished the follow-up clinical trial, which is combining the FDA-approved CDK4/6 inhibitor palbociclib together with the Bruton tyrosine kinase inhibitor ibrutinib. After the phase I trial, it looked great; it was very durable, low toxicity, and incredible complete responses by preliminary analysis. We also know the difference between a responder and a nonresponder at the molecular genetic level. The phase I trial has finished, and we are looking forward to a phase II to validate everything that we have found in the phase I study. Are there any foreseeable hurdles? Yes. What we have done—taking advantage of purifying tumor cells—has led us to know what is happening in tumor cells. We must address the tumor and its microenvironment, particularly the immune cells, because checkpoint action is very important for all cancers. We are headed that way. The other thing is understanding how to target tumor cells and spare normal cells. Metabolism is going to play an essential role, as well. Also, we have very few patients who progress on treatment. Thus far, we only have 4 [who progressed], which is remarkable. By longitudinal sequencing, we know the difference during relapse versus the time that they are responding. We have those tools, and we are designing salvage therapies for these patients. A challenge is that some of these questions cannot be addressed in the immune-deficient mouse models. But this a very special time, and we can do it. What do you hope oncologists take away from these early findings? We focus on lymphoma so that we can find answers that are not as easy to find in solid tumors. I am sure that there are common mechanisms that are operating in hematologic malignancies and in solid tumors. Some of these clinical trial findings will be applicable to solid tumors, as well. I am hoping that people will collaborate. We are in a very special time. In 2014, we were barely starting; we have really come a very long way in 4 years. Liberto MD, Martin P, Huang X, et al. Repression of IRF4 and CYTIP unleashes anti-tumor interferon response in CDK4 inhibitor therapy in mantle cell lymphoma. In: Proceedings from the 2018 AACR Annual Meeting; April 14-18, 2018; Chicago, Illinois. Abstract 1523.